This is a light-hearted project which I conceived of when shaving my beard. I often skip shaving until I realize I look like a chimpanzee. This project was conceived to remind myself when to shave. Since there are no existing labelled datasets for male faces showing days since last shaved, I created a script which allows one to generate their own labelled data. Bro, did you just assume my gender? No, I didn't. I am not sexist or beardist. If you do not sport a beard, fear not! By making a few changes, mainly to data collection and test scripts, you can adapt ShaveNet to recognize emotions. You can save data with different emotions as labels and train your own emotion detector! If you are Kristen Stewart and the ConvNet cannot detect your emotions, please raise an issue. The code in this repo is a good guide for a beginner to neural networks and tensorflow. The scripts are a good tutorial for an end to end machine learning project involving data collection, augmentation, low level implementation of a ConvNet in tensorflow with tf.nn API, evaluation of training with tensorboard and evaluation on a live camera feed. 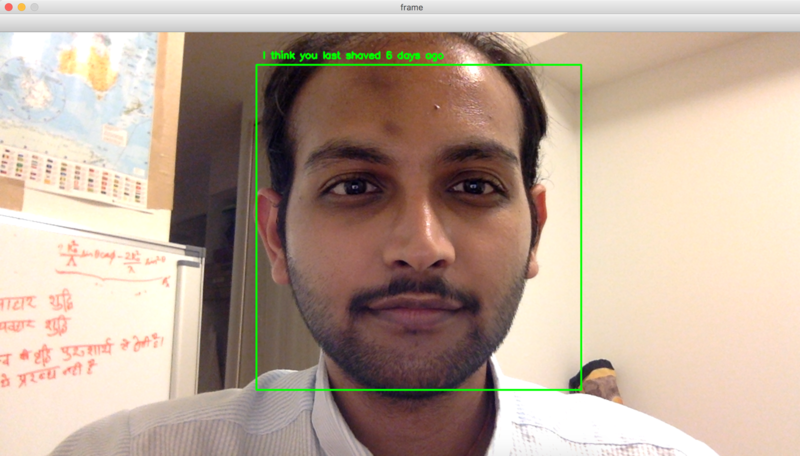 From a practitioner's point of view, it is more satisfying to see how machine learning works on your own face data, rather than arbitrary objects from a well known dataset. Step 1. Shave your beard on day 0. From day 0 to about one week, record training data using collect_data.py. Step 2. Apply data augmentation with hey-daug. Step 3. Train a fairly shallow ConvNet with train.py. Step 4. Test on your face with test.py. Yes, it has been 6 days! Most of the tensorflow syntax is very old (written for tf 1.1) and low-level. This is nowhere near an optimal architecture for solving the problem. The basic demonstration is complete, but this is still a work in progress. The scripts use a haar cascade object detector to detect faces. This requires a file called haarcascade_frontalface_default.xml, which can be found in your OpenCV installation. Since it is the intellectual property of Intel, I cannot provide it on this repo. Train a model to advise when to bathe. Library and CLI for "scrambled" printing in terminal.